Spanish music has a fundamental allure. 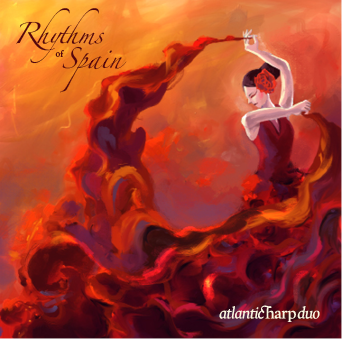 The fiery Flamenco rhythms and sensual Moorish harmonies evoke Latin passion and pride. Throughout the centuries, Spanish composers have embraced this national idiom, bringing these unmistakable rhythms to audiences worldwide. Though often associated with the angelic, the harp’s percussive but lyrical nature makes it an ideal instrument for this devilish combination. Rhythms of Spain is composed entirely of transcriptions of works ranging from the symphonic to chamber music to piano solo. The combination of two harps with percussion instruments allows for a colorful rendition of these various instrumental textures.